If you want straighter teeth but are concerned about how you’ll look with metal braces, we offer an alternative. Clear Braces consist of transparent or tooth-coloured brackets which are discreet and are virtually invisible so you’ll look great throughout your treatment. They still provide the same fabulous results. They blend in with your natural teeth and are suitable for both adults and children. At Bedford Specialist Orthodontic Practice we use Clarity™ Advanced Ceramic brackets because they deliver brilliant aesthetics, small design, predictable de-bonding and enhanced patient comfort, through the combination of progressive technology and state-of-the-art design. A revolutionary leap forward in orthodontic ceramic brackets. 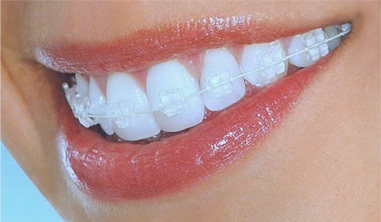 Designed to blend with one’s natural tooth colour so they are much less visible than conventional fixed braces. They will resist staining and discolouration over the course of your treatment. The brackets no longer require a metal slot liner.